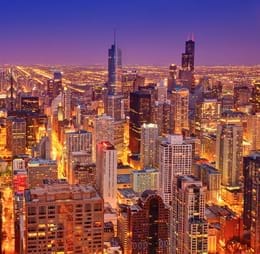 Chicago is the third most populous city in the United States, after New York City and Los Angeles with 2.7 million residents. Chicago has grown to be one of the most important cities in the United States and the world. Today the city is an international hub for Finance, Commerce, Industry, Technology, Telecommunications and Transportation with O’Hare International Airport being the busiest airport in the world. Make sure to book your flight tickets to Chicago well in advance in order to grab amazing deals and offers from Rehlat- One of the fastest growing online travel companies in the Middle East. Hurry up and book your Chicago flight tickets now. There is something unique for everyone in Chicago. Wonderful culture, interesting history, and friendly mid-western hospitality accent the thousands of activities and things to do. Your options are endless with wonderful city tours, zoos (Lincoln Park Zoo), family attractions, aquariums (Shedd Aquarium is world famous), diverse food and dining choices, lake cruises and harbor tours, planetariums, bicycle riding and bike tours, skyscraper observatories, late night music and jazz tours, and so much more. Any shopping adventure in Chicago should begin with the granddaddy of all Chicago retail: The Magnificent Mile. This cosmopolitan, history-packed section of Michigan Avenue teems with shopping, dining, and entertainment treasures that make any vacation unforgettable. Chicago's shopping destinations also extend throughout the city. Chicago’s Loop has been a shopper’s paradise for more than a century and is anchored by State Street, where you can stroll through the legendary Macy's on State Street that's part retail mecca, part history museum. Also don't miss the boutiques that line the streets of Chicago's diverse neighborhoods. Chicago is famous for its food – not only as a gourmet dining epicenter, but as the home of several local specialties. For an authentic experience, get a taste of these culinary staples with this Chicago guide to deep-dish pizza, the classic Chicago-style hot dog and the Italian Beef. The Chicago Transit Authority (CTA) operates the nation’s second largest public transportation system, serving the City of Chicago and 40 neighboring communities by rail and bus. For full fare information, transit card retailers and maps, visit the Chicago Transit Authority Website at TRANSITCHICAGO.COM. Buses: More than 100 routes lace the city buses stop every few blocks. Several lines operate 24 hours a day. Exact change is required for cash fare. Single ride $2.25 Full Fare with Reloadable Ventra Card (bus and rail). The O’Hare international airport of Chicago operates to both domestic and international destinations through many major airliners namely Air Lingus, Aeromexico, Air Berlin, Air Canada Express, Air Choice One, Air France, Alaska Airlines, Alitalia, All Nippon Airways, American Eagle, Avianca El Salvador, BH Air, Cathay Pacific, Cayman Airways, Copa Airlines, Delta Shuttle, Finnair, Frontier Airlines, Hainan Airlines, Iberia, Japan Airlines, KLM, Korean Air, LOT Polish airlines, Lufthansa, Royal Jordanian, Scandinavian Airlines, Spirit Airlines, Swiss International Airlines, Turkish Airlines, United Express, Volaris, and WestJet. The airport has an underground station which is accessible by the pedestrian tunnels of terminal 1, 2, and 3. Trains run throughout the day operating all through the week, connecting from downtown Chicago to Forest Park. Many cars and taxis are available at an average fare, which depends upon traffic and the distance of travel. There is a regional bus shuttle centre that allows the passengers to commute between Indiana, Lowa, and Wisconsin. The bus shuttle stage is on the ground level of the airport accessible by all the passengers by a pedestrian tunnel coming from terminals 1, 2 & 3.